Fig. 3. Pipeline for dpsLCW. (A) Steps for WGS reads of reference and alternative species are shown in different colored boxes, blue and red, respectively. The adopted programs in each protocol are shown in orange boxes. (B) Yellow colored, variously colored, and grey colored small rectangles indicate SSR motifs, reference WGS reads, and alternative WGS reads, respectively. 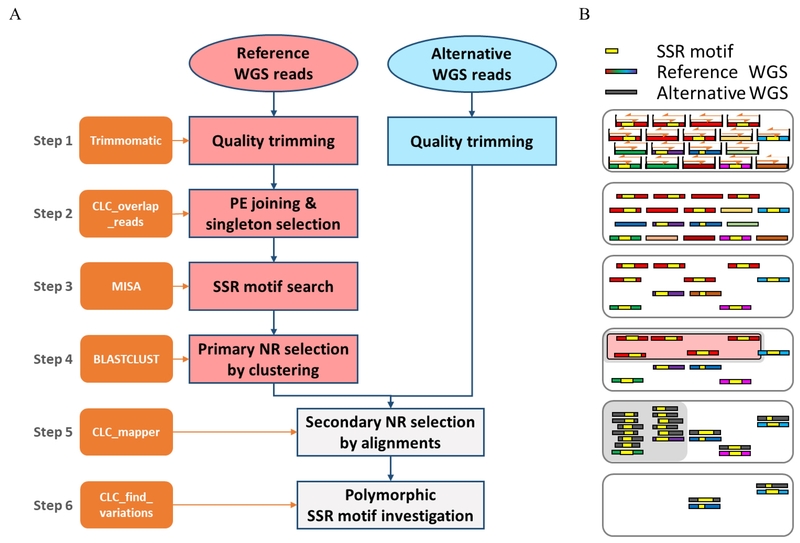 Same colored rectangles of reference WGS represent homologous WGS reads. WGS reads in the pink box indicate one cluster in step 4. The WGS reads in light grey regions in step 4 and 5 were not used in further steps.